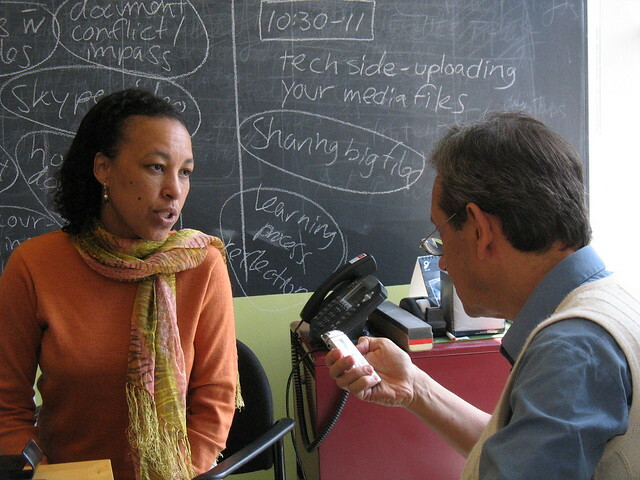 Sebastiao Ferreira interviews Ilma Paixao in a 2009 media workshop at MIT CoLab. 10:20 a.m. : Just listen. Find a partner. If you’re participating from work or home, ask one of your coworkers or a colleague on video skype/google chats to do the activity with you. Go to a private or semi-private area. Each of you will have six minutes to tell your life story to your partner. The storyteller decides how to structure her story and what information to include. The listener must not speak while the storyteller is speaking. The listener should not ask any clarifying questions, or even mutter “ah ha” and “mm”. When six minutes are up, the listener can ask one follow-up question. The listener will then have a few minutes to tell the storyteller what she thinks her strengths are. Finally, the storyteller and listener switch roles and repeat the exercise. Stories are confidential. Debrief: After the activity, participants will talk about how it felt to just listen. How did you feel as you were listening to your partner’s story? Was this kind of listening different from other listening experiences you’ve had? If you’re participating from afar, tweet your thoughts with the hashtag #planningstories and jump on the etherpad for the course, where we’re taking public, collaborative notes. 1. Cizek, Katerina. Unexpected. National Film Board of Canada. 2008. 2. Boo, Katherine. “The Marriage Cure”. The New Yorker. August 18, 2003. 3. Abumrad, Jad and Robert Krulwich. “Yellow Rain”. Radiolab. September 24, 2012. 4. Yang, Kao Kalia. “The Science of Racism: Radiolab’s Treatment of the Hmong Experience”. Hyphen. October 22, 2012. The producers of these stories took special care to listen, sometimes using uncommon methods. “Unexpected” is a movie about young mothers who learn to make their own movie. In “The Marriage Cure,” you’ll wonder how the author ever managed to capture certain details. In “Yellow Rain,” the subject of a radio broadcast felt that the hosts did not listen, and so she published her own essay, “The Science of Racism”. How can you make sure you’re hearing the whole story? If you’re participating from afar, tweet your thoughts on these stories with the hashtag #planningstories and jump on the etherpad, where we’re taking public, collaborative notes. 2. ”Illegal.” Directed by John S. Carey. 3. Vargas, Jose Antonio. “Not Legal Not Leaving.” Time Magazine. June 25, 2012. What makes for compelling story? How did the storyteller achieve a compelling story on a technical level. What angles did he capture? What quotes did he highlight? Tweet your thoughts under the hashtag #planningstories and watch the class discussion notes in our etherpad. 1:50 p.m. : Create a data story. We’ll start this session with a class twitter brainstorm on the most compelling pieces of data you’ve ever heard. Tweet one piece of data that has moved you, and why. Share your ideas from your twitter account and use the hashtag #planningstories. Statistics and maps are thrown at us everyday in the news. Numbers can play an important role in setting up context for a story. This activity will introduce the class to several web-based tools and sites that help users find and visualize data. We will do a brief training on one such site, metrobostondatacommon.org and discuss what types of stories emerge from the data. If you’re participating from home, do the online training tutorial. Then go to metrobostondatacommon.org and create a map. Share your map with us on twitter and we’ll share ours, too. On the third day of the workshop, students in the classroom will be working all day on creating their stories. Are you working on a story project? The course instructors (Aditi, Stefanie, and Alexa) will be on-call to work directly with you on your story. Email us at colabradio@mit.edu and we’ll schedule a time to talk with you one-on-one via Skype, phone, or Google Hangout. We hope to speak with you. Post by Alexa Mills, Stefanie Ritoper, and Aditi Mehta.